The cost of traffic congestion could double in the next decade if the problem is not addressed, the RAC Foundation has warned. 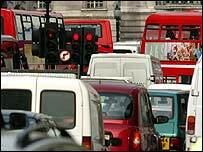 It said traffic jams currently cost businesses £15bn a year in lost working hours, but that could reach £30bn. The foundation said more money was needed to improve the nation's roads, which faced a transport "crisis". It also called for a national road user charge, but only when such a move would be "acceptable to motorists". The foundation said the figures it used were based on business estimates of productivity lost because staff were stuck in traffic. These were then adjusted in line with government forecasts of traffic growth over the next decade. The foundation said: "A transport crisis is looming if the new government buries its head in the sand and fails to develop and fund a national transport strategy." The "Agenda for Action" launched by the foundation calls for the roads network to be urgently improved. The foundation's Sue Nicholson said the government collected £42bn in road taxes and charges, but reinvested only £15bn into road and transport maintenance. "Without urgent action, our transport system is headed for the buffers," she said.